It was just after 9pm on Saturday when Anak Krakatoa, a volcano located in the Sunda Strait between the Indonesian islands of Java and Sumatra, erupted. Twenty-four minutes later, a devastating tsunami struck the nearby rim of the strait, killing hundreds of unsuspecting people and causing widespread destruction. It was just the latest eruption of Anak Krakatoa, which has been active sporadically since emerging from the sea in the 1920s. More recently, it has been spewing ash and lava since June. Experts say the tsunami, or seismic sea wave, was likely caused by the collapse of a big portion of Anak Krakatoa’s southern flank. They believe this triggered underwater landslides which displaced water to create the large, killer waves. “Underwater landside is the leading theory,” Sam Taylor-Offord, a seismologist at GNS Science in Wellington, said on Monday. “So when that land pushes into the ocean … it displaces the ocean surface causing the vertical displacement that causes the tsunami,” he added, noting however that the lack of data and access made it impossible to ascertain this theory. 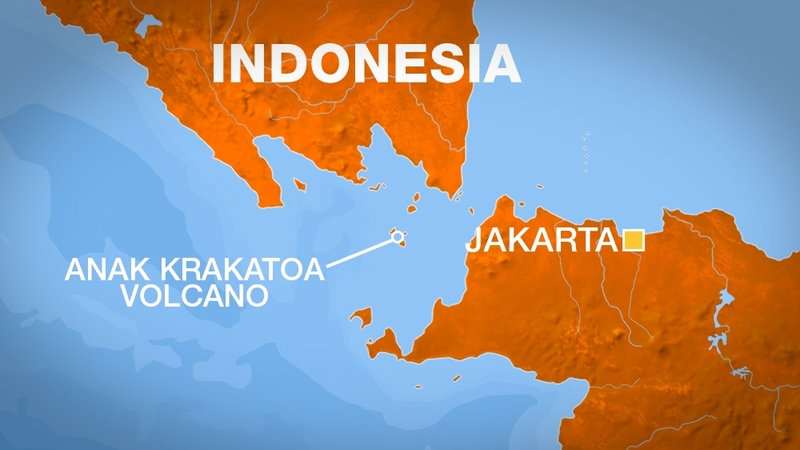 Ben van der Pluijm, an earthquake geologist and professor at the University of Michigan, also said the tsunami may have been caused by Anak Krakatoa’s partial collapse. Anak Krakatoa formed over years after the explosive eruption of the Krakatoa volcano in 1883, one of the largest and most catastrophic in recorded history. Before 1883, the only confirmed eruption on the Krakatoa island group was a moderate one, some two centuries before, in 1680. But at 1pm on August 26, 1883, the first in a series of increasingly violent explosions sent a black cloud of ash 27km above Krakatoa. The climax was reached at 10am the following day, with tremendous blasts that were heard some 3,500km away in Australia, ash that reached a height of 80km and a series of powerful, far-reaching tsunamis – the event was described as “the explosion heard around the world”. Some 36,000 people were killed in Java and Sumatra in the tsunamis that followed the volcano’s collapse, with the greatest wave reaching a height of 37 metres. Krakatoa’s discharge sent nearly 21 cubic km of rock fragments into the air, while large quantities of ash fell over an area of some 800,000 square km – as a result, the region surrounding the volcano was plunged into darkness for more than two days. The dust drifted several times around the globe, creating dramatic red and orange sunsets throughout the following year. A global temperature drop was also recorded. A thick layer of sterile ash meanwhile covered everything on Krakatoa, and plant and animal life did not begin to reestablish itself for five years. Krakatoa remained quiet until December 1927, when a new eruption started on the seafloor along the same line as the previous ones. In early 1928, a rising cone reached sea level, and by 1930 it had become a small island – Anak Krakatoa, or “child of Krakatoa”. Anak Krakatoa’s cone has continued to grow ever since, and it’s currently standing at an elevation of about 300 metres above the sea. With the exact cause of the disaster still unknown, and Anak Krakotoa still rumbling, authorities and scientists are wary of the risk of a tsunami recurrence. “The likelihood of further tsunamis in the Sunda Strait will remain high while Anak Krakatoa volcano is going through its current active phase because that might trigger further submarine landslides,” Richard Teeuw, of the University of Portsmouth in England, said. Teeuw said that sonar surveys would now be needed to map the seafloor around the volcano, but “unfortunately submarine surveys typically take many months to organise and carry out,” he added.